Last Friday’s 2% tumble in the S&P 500 was the second largest down day of the year and the biggest threat yet to 2019’s stunning rebound. The only constructive thing we could say about Friday’s devastation is the collapse stopped right at 2,800 support. But as worrisome as Friday felt, two days later we are still hanging on to this critical support level. Weak economic data kicked off Friday’s selling in Europe and the carnage continued when US markets opened. But the thing about these headlines is they didn’t reveal anything investors didn’t already know. Last year’s huge correction was fueled by the fear of slowing global growth and by now everyone knows this is a problem. The thing to remember about news is the more people that know about it, the less important it is. We saw a truckload of selling last year in October, November, and December. Nervous owners abandoned the market like rats jumping off a sinking ship. But the thing about all that selling is those fearful owners were replaced by confident dip buyers. While one person jumped out, another person jumped in. These dip buyers demonstrated a willingness to buy stocks in that negative headline environment. If they didn’t mind the headlines then, what are the chances are they will mind them now? And that is why every negative headline and modest dip this year has been met with indifference. Confident owners are not afraid. When they don’t care about recycled headlines, the market doesn’t care. When the market doesn’t care, then neither should we. 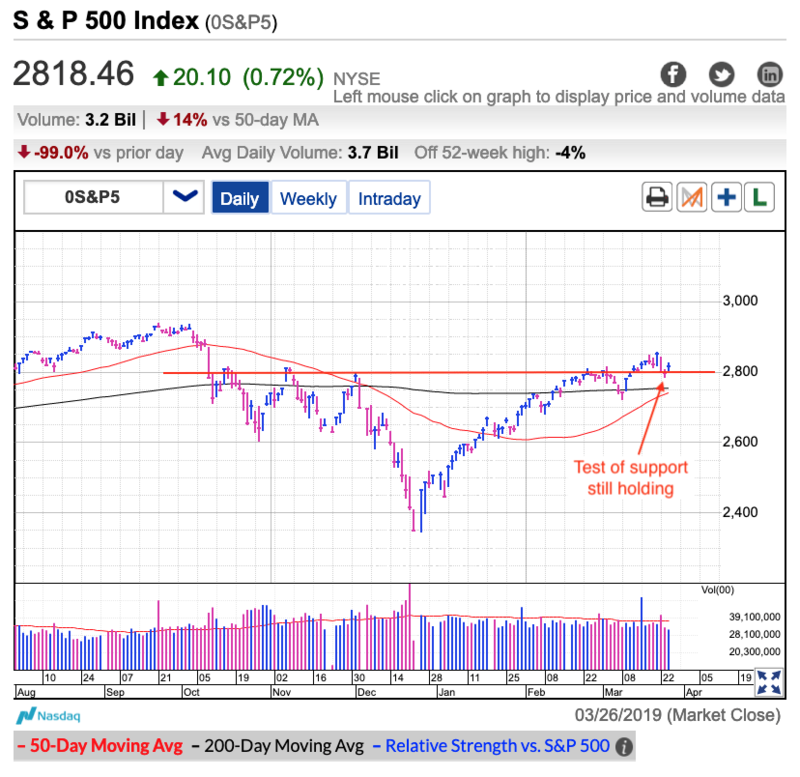 While Friday was noteworthy, the real test of support came Monday when we dipped under 2,800. But rather than trigger an avalanche of defensive selling, supply dried up and we finished Monday flat. While it is hard to get excited over flat, given how ugly Friday was, flat is pretty darn impressive. Market collapses are brutally quick. They move faster than people think because the panicked crowd sells first and asks questions later. But rather than hit the sell button Monday, most traders stood around and waited to see what everyone else was doing. By nature, investors are an optimistic bunch. They prefer holding stocks for higher prices and are always reluctant to let them go prematurely. That is why it is no surprise when you give investors a little breathing room, the anxious selling pressure evaporates. Three days later and that is exactly what happened. Selling dried up and prices bounced. While we are not in the clear yet, every hour that passes without tumbling lower decreases the probability we will tumble lower. While we only recovered a sliver of last week’s losses, the fact the selloff stopped in its tracks is a big win. Market crashes are breathtakingly quick and the longer we hold these levels, the less likely a continuation lower becomes. I like the way the market is acting and the path of least resistance remains higher. That said, the rate of gains is slowing and that means we should expect more of back and forth. While I’d love to see the market surge higher every day, down days are a very normal and healthy part of every move higher. Resist the temptation to join the herd overreacting to every bump in the road.